This amazing transformative tool, www.Bio-Mat.com, has recently come to the forefront of spiritual tools. Please check out the website and judge for yourself whether you think this new tool is for you. The New Age Center presently offers private sessions. The fee is $15/30 min and $25/hour. I personally have experienced it a few times and received immediate results. This tool is especially important for holistic practitioners as well as for ordinary spiritual seekers. This is state-of-the-art light technology that reverses the degenerative disease cycle and speeds cellular renewal. Be sure to watch the free 20-minute video and learn how this magnificent health tool alleviates ailments and restores vitality! We love our Bio-Mats, and know that you will love yours, too. We sleep on our Bio-Mats every night and sit on our mini-mats during the day. We can't imagine our life without them. Ninety-five percent of people experience pain reduction, relaxation, rejuvenation, and mental and emotional ease in just 15 minutes. We don't know any other therapeutic tool that accomplishes so much in so little time. Its effects are cumulative over time, as you will learn from the video. The Bio-Mat is different from any other infrared or negative ion-generating device on the market and is the original far infrared mat of its kind. The Bio-Mat uses NASA technology to generate far infrared waves, using special compounds of alumina and silica, which can convert any normal energy into infrared rays very efficiently at room temperature. Japanese kurare's super fiber is used in the construction to generate far infrared. The Bio-Mat is a unique medical device producing both far infrared as well as generating medium (8.8 micron wavelength) 'Human' infrared. According to NASA research, Human infrared normalizes a variety of important physiological functions, especially glandular functions. This Human infrared feature of the Bio-Mat makes it different from any other infrared device on the market. The Bio-Mat generates this special spectrum of 8.8 micron infrared through a special sensor that amplifies the amount of 8.8 micron infrared exposure. The Bio-Mat includes another sensor that generates 10 Hz infrared. World renowned scientist Dr. Chian, of China, demonstrated that 10 Hz infrared acts as an information carrier when passed through various materials, including human and animal DNA, pheromones, as well as gemstones such as amethyst. Bio-Mats with 10 Hz sensors were tested along with a control group of Bio-Mats without the 10 Hz sensor. The most potent healing effects occurred only in the group with the 10 Hz sensors. This means that infrared alone was not as effective for the healing, but rather the addition of information being released from the amethyst provided the greater effect, as hypothesized by the researchers. As one Korean research scientist said, "It appears that with infrared we are talking about energy, but with the addition of amethyst, the 10 Hz infrared, we are now talking about energy plus healing information." This is the critical difference between the uses of infrared saunas, infrared mats (without 10 Hz infrared or amethyst) and the Bio-Mat. This may explain why so many reports of healing have occurred over the history of the Bio-Mat. 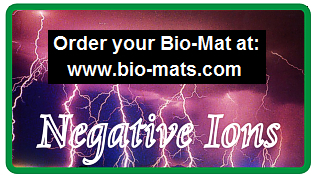 The Bio-Mat also delivers negative ions, which energizes the body for optimal health. The negative ions delivered through the Bio-Mat are delivered directly to the body through the skin's surface via conduction. This greatly differs from ambient air ions delivered through popular negative ion generators used for air cleaning, which NASA reported only positively affect 26% of people. The direct conduction of negative ions allows for an immediate response and change in the body's electrical field for all people, assisting them to achieve an optimal physiological state. Indoor environments, city living, automobiles, exposure to electronic devices, EMF's (electro-magnetic fields), and environmental pollution all result in increased positive ions in the body, tilting the ratio of ions towards the positive. This results in a physiological imbalance, which may have detrimental health consequences. Too few negative ions in the body can cause a number of diseases. Some of the health problems associated with an imbalance of ions in the body include: anemia, allergies, shoulder pain, lumbago, rheumatism, neuralgia, headaches, kidney problems, imbalanced autonomic nervous system function, insomnia, and fatigue. The Bio-Mat is further enhanced with gemstone-quality amethyst crystals, known since ancient times for their calming and healing effects. The "Amethyst Effect" is a change in infrared light when refracted through amethyst crystals. Scientists experimented passing far infrared light through a variety of substances, including various gems, glasses, and plastics. Amethyst was found to be the only substance which clearly changed the spectrum of infrared light. According to scientists, waveforms mimicked patterns similar to the human voice. Crystallography shows far infrared refracted through amethyst crystals organizes far infrared into geometrical patters with higher bio-compatibility. Korean researchers propose that addition of the amethyst allows for greater increase in the utilization of the light by the human organism. Far infrared rays penetrate six to eight inches into the human body. These rays not only benefit the skin and muscle tissue on the surface of the body, but penetrate into deeper tissues. The far infrared penetrates into the lymph glands, blood vessels, nerves, and key organs. The rays optimize the health of these tissues in a number of ways. Scientists propose that among the waves within the energy spectrum coming from the Sun, far infrared waves are by far the safest and most beneficial electromagnetic energy available for the human body, directly affecting all metabolic and cellular functions. far infrared waves raise body temperature, warming the blood and expanding the blood vessels. There is an increase in peripheral blood flow and volume, resulting in improved circulation and heart function. far infrared ray's deep heat raises body temperature, inducing an artificial and healthy fever. As the body works to combat the "fever," the body's immune system is activated and strengthened. Combined with the detoxification of harmful toxins and waste products, one's overall health and resistance to disease are greatly improved. The deep heat of the far infrared helps peripheral blood vessels dilate, bringing relief and healing to muscles and soft tissue injuries. Increased blood circulation carries off metabolic waste products and delivers oxygen-rich blood to oxygen-depleted muscles, so they recover faster. As one relaxes in the gentle heat of the far infrared, one's body is actually hard at work, producing sweat, pumping blood and burning calories. According to a Journal of the American Medical Association report, a single far infrared session burns as many calories as rowing or jogging for 30 minutes. Far infrared heat therapy is widely used to treat patients suffering from many kinds of arthritic and musculo-skeletal disorders. In addition, it has been proven effective in the treatment of sprains, neuralgia, bursitis, muscle spasms, joint stiffness and many other musculo-skeletal ailments. Stiffness, aches and soreness that come with aging are reduced or eliminated using far infrared. The gentle warmth of the far infrared rays helps to sooth nerves and relaxes tight or knotted muscles. The end result is reduced stress and improved energy. The Bio-Mat's far infrared and negative ions penetrate the skin deeply, helping detoxify impurities from the skin and lymphatic system. In addition, exfoliation is greatly enhanced by the far infrared, rapidly removing dead skin cells. Increased circulation draws the skin's own natural nutrients to the surface, rejuvenating the skin's health and appearance. Far infrared helps to detoxify the body in several important ways. Increased blood circulation stimulates the sweat glands, releasing built-up toxins and waste. Daily sweating can help detoxify the body as it rids itself of an accumulation of potentially carcinogenic heavy metals, alcohol, nicotine, sodium, sulfuric acid, cholesterol, and uric acid. In addition to causing the body to sweat, far infrared is capable of removing toxins via several other bodily systems.